Hi, Kristi here, from SweetKM. 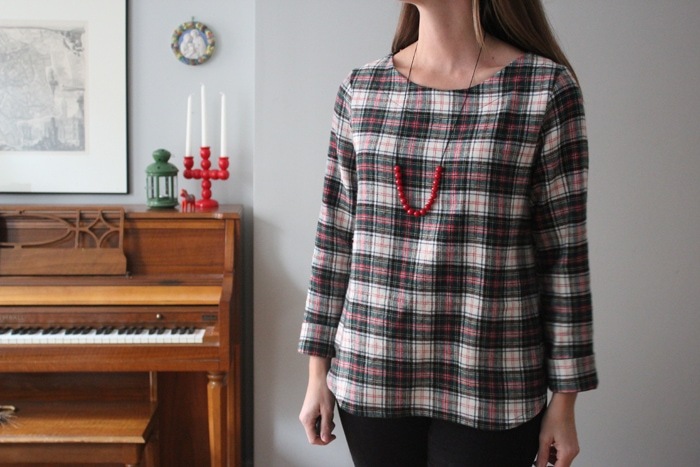 Today I’m sharing a toasty flannel Shoreline Boatneck top. I’m calling this my Christmas casual outfit. I like to dress up for Christmas Eve, and I usually wear pajamas when we open presents in the morning. This festive, but easy to wear, outfit is perfect for all the family visits, or traveling happening the rest of the day. The Shoreline Boatneck pattern feels like it was drafted just for me. I cut a straight medium based on my measurements. 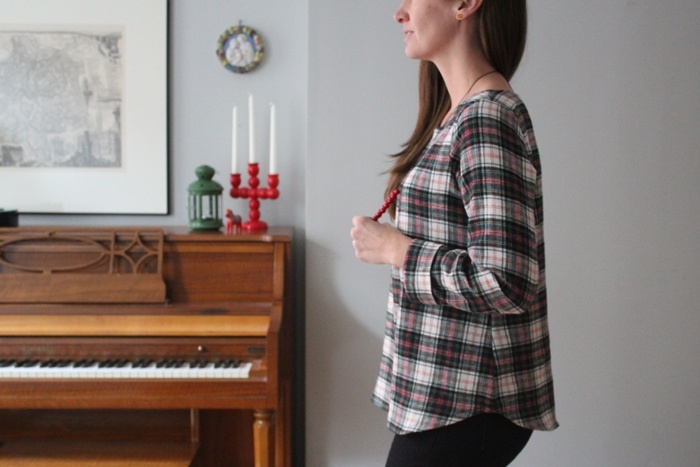 I usually blend between sizes, but the waist to hem flare of this top brushes over my hips perfectly, and gives a crisp shape to this very soft flannel. I made this top as written except that I lengthened the sleeves so I could make a 3" hem, allowing me to cuff them at the wrist (or not, if it's chilly). This top is a really quick sew. I printed the pattern, made a muslin, and sewed the complete shirt in less than a day! 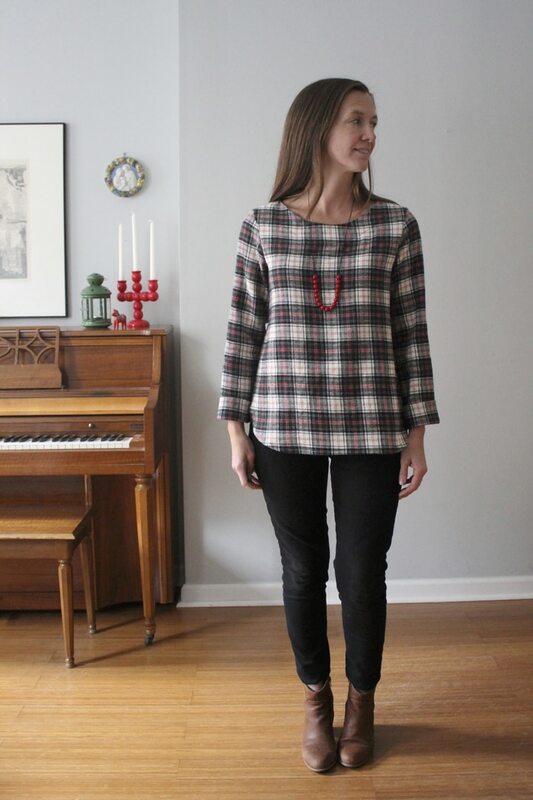 For this holiday top I chose a cream, black, red, and green cotton flannel shirting from Joann Fabric. It's the perfect weight for a woven tee, and the perfect color scheme for casual Christmas wear. 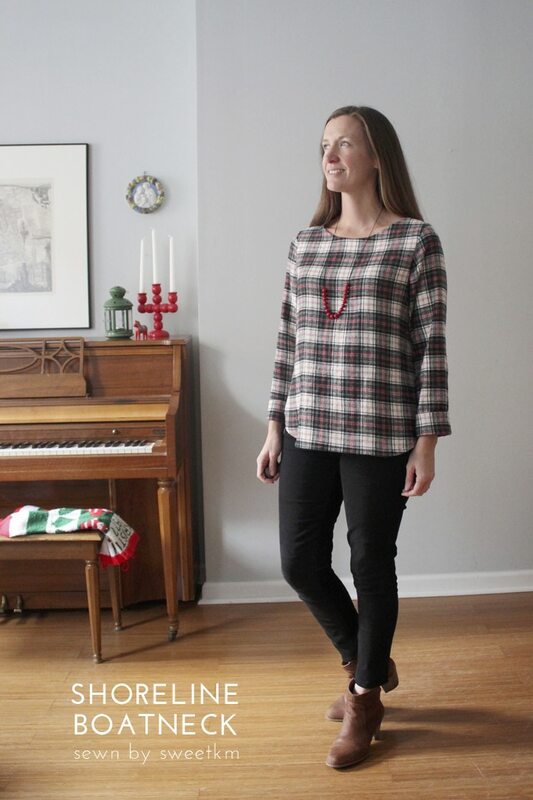 Today I'm amping up the festive side of my Shoreline Boatneck with a bright red necklace. In January no one will even know it's a Christmas shirt when I wear it layered under a jacket or cardigan.